The i20 Active is based on the i20 and will share the same design as the premium hatchback but will come with the typical crossover looks like roof rails, skid plate and the black cladding on the sides. The facelifted version will debut at the Auto Expo 2018. 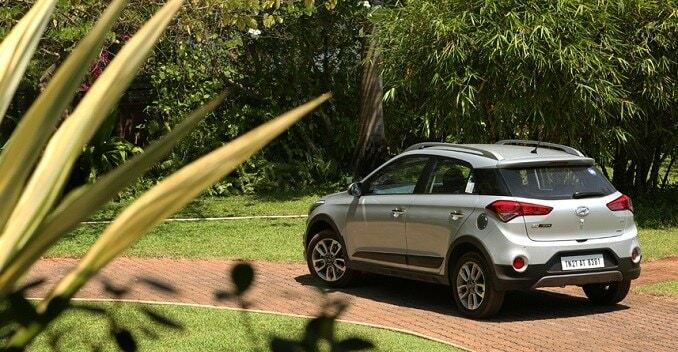 The Hyundai i20 Active has been a strong seller in the popular crossover segment. Hyundai has had a good run with the car and yes, it is a segment leader here. However, the segment is quickly getting crowded and with new players like the Ford Freestyle making its way into the market, Hyundai has had to up the ante with regards to the i20 Active. The carmaker is all set to launch the Hyundai i20 Active facelift at the Auto Expo 2018 and it will come with a bunch of changes which will keep it in tune with Hyundai's current design philosophy. The 2018 Hyundai i20 Active is based on the i20 and it will share the same design as the premium hatchback but will come with the typical crossover looks like roof rails, skid plate and the black cladding on the sides. The i20 Active will now come with the trapezoidal front grille, blackened honeycomb mesh and sharp sweptback headlamps. It will get projector headlamps and integrated LED DRLs. There are new fog lamp housings too and all of this will certainly make it look better and more contemporary. The Hyundai i20 Active facelift will come with sharp creases on the sides and we expect a new alloy wheel design to be introduced as well. As far as the dimensions are concerned, the the facelifted model will be identical to the current model and will be under the 4 metre mark. It'll be 3,995 mm in length, 1,760 mm wide and 1,555 mm tall while the wheelbase will continue to be 2,570 mm. The ground clearance too will remain the same at 190mm. The big changes, however, will be on the inside as it will be more stylish and also feature rich. It'll come with a larger touchscreen infotainment system and will also get Apple CarPlay and Android Auto and we look forward to see what these big changes look and feel like. The model will be completely revealed at the Auto Expo 2018. There are no changes expected in the powertrain of the car and we expect it to come with the 1.2-litre Kappa petrol engine which is good enough for 83 bhp and the 1.4-litre diesel which will churn out 89 bhp. It will be available only with the manual transmission for the time being. Hyundai will also showcase a host of other offerings at the Auto Expo 2018, with the all-new Santro certain to grab a lot of attention. Make sure to keep watching this space as we bring you all the details from ground zero and February 7-8.